Vintage McCoy USA 135 Early Farm Small. Blue & Pink Striped Cream pottery Canister Jar & Lid. Nice condition but there is a small hairline crack on the upper part of the canister (you can see in the picture), clean inside and out. Lid included and is perfect. Bottom stamped USA 135. Measures 5" diameter at the widest point, by 7 1/2" high with lid. I have another size listed from this set. Vintage McCoy USA 135 Early Farm Small. 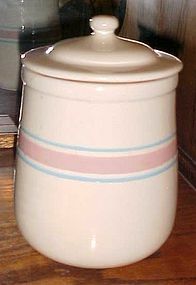 Blue & Pink Striped Cream pottery Canister Jar & Lid. No chips or cracks, clean inside and out. Lid included. Bottom stamped USA 135. 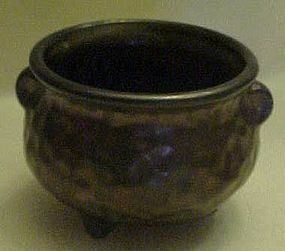 Measures 5" diameter at the widest point, by 7 1/2" high with lid. I have another size listed from this set. Vintage McCoy USA 131 Early Farm Med. 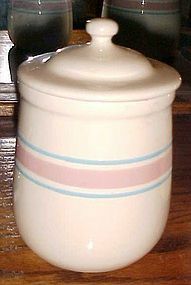 Blue & Pink Striped Cream pottery Canister Jar & Lid. No chips or cracks, clean inside and out. Lid included. Bottom stamped USA. Measures 6-3/4" diameter at the widest point, by 9" high with lid. I have another size listed from this set. 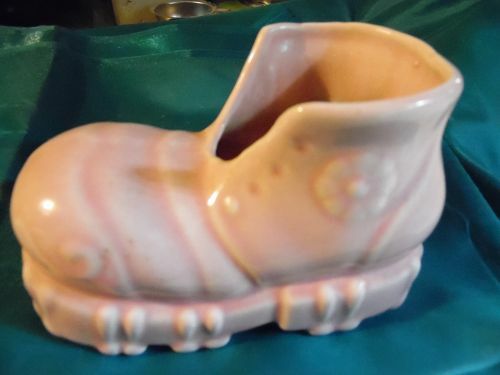 Vintage mcCoy mini Holland Dutch shoe is a wall pocket / planter. Measures 4 1/2" long. 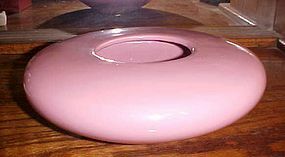 Yellow glaze with Pink applied tulip. Perfect condition. I have 2 identical ones available. Price is for 1 shoe. McCoy Pottery Yellow Floraline Footed Vase McCoy Pottery's Floraline yellow with tan speckles footed Vase. Marked Floraline, USA, 453. 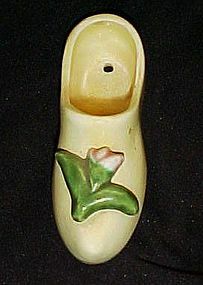 Vase measures 7 1/2'' long, 4'' wide and 6 3/8'' tall. 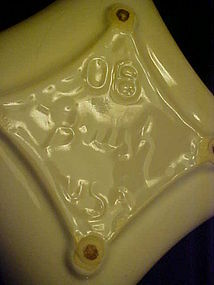 There are a couple of the typical manufacturing glaze drips and blobs. 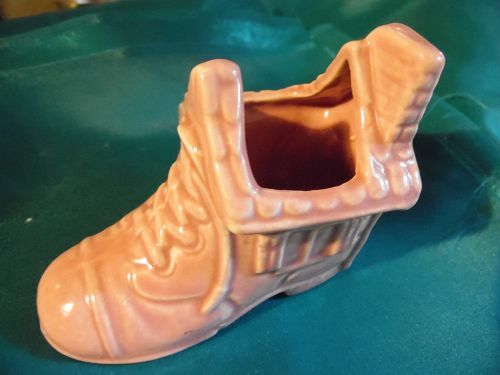 No chips, cracks or crazing on this very collectible vase. Large vintage pottery terrier dog figurine, McCoy? 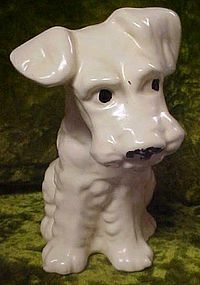 Take a look at this wonderful vintage dog figurine. It measures 7 1/2" tall and has a soft low sheen glaze with black cold paint accents on the nose and eyes. Not sure which kind of terrier he is, A scotty, wire hair, or maybe an airdale puppy. He is adorable though. A little wear on the cold paint on his nose. No chips or cracks. 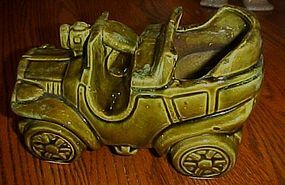 He looks like McCoy though, but there are no markings of any kind, and could be some other old pottery company. A must have for dog colectors. 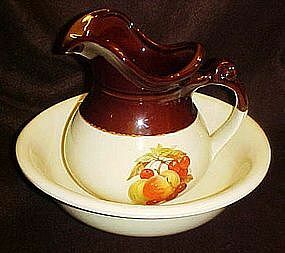 McCoy Pottery fruit festival pitcher and bowl set. Very nice condition, no chips or cracks. 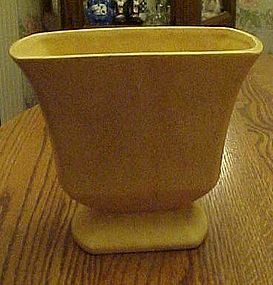 Stands 9 inches tall, bowl is 10.5 wide. McCoy 7515 USA LCC mark. (Lancaster Colony Co. operated McCoy for a time period. 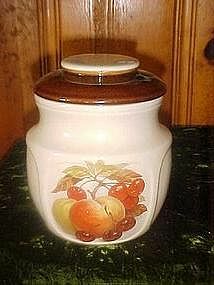 Older McCoy pottery cookie jar dates 1961. 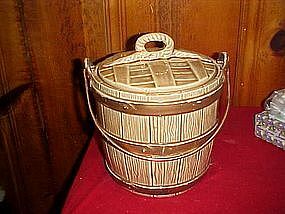 THe old oaken bucket measures about 10" tall . Copper bail and the ceramic rope on the lid loops to make a nice handle. 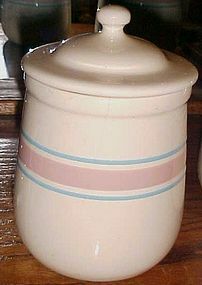 The cold paint on the barrel staves is worn on the edges but still looks good for a cookie jar of this style and vintage. The only flaw is a thin chip inside the rim of the lid. Which is not real noticeable because it's on the inner unglazed part of the lid. 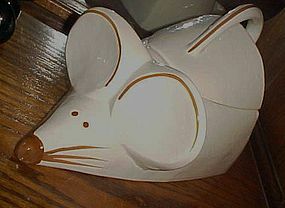 A nice cookie jar. 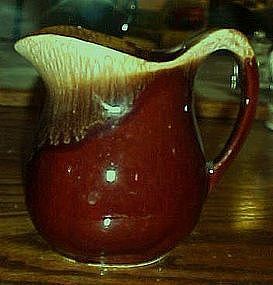 Marked USA and made by McCoy in 1985. This is the Panel cookie jar that was made with various decals. This decoration is of assorted fruit, cherries, and peaches. 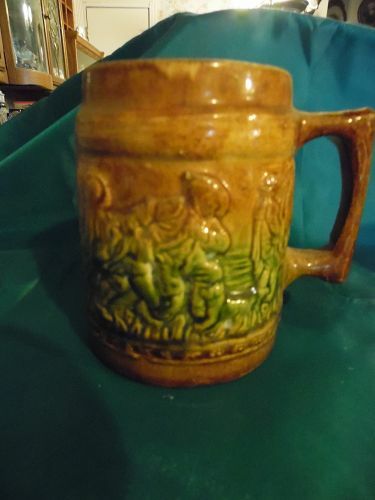 Measures 8" tall and is in Fantastic condition with no chips or cracks.